It was 30 years ago, on April 26, 1986, that disaster struck nuclear reactor number 4 in Chernobyl. At first, Soviet officials attempted to hide the cataclysmic events unfolding in Ukraine, but when radioactive clouds were detected as far away as Sweden, news spread that the unthinkable had happened: a lethal explosion at a nuclear power plant. Residents at the neighboring workers’ town of Pripyat weren’t told of the deadly radiation covering their homes at first. As official buses began evacuating the area, people were instructed to bring only a suitcase, since they would be able to return in a few days. But as the extent of the explosion became clear, the Soviet military established an official Exclusion Zone, a roughly 18-mile radius around the stricken power plant. About 115,000 people were evacuated in 1986, and another 220,000 in the following years, creating a desolate landscape of abandoned towns and villages. Thirty years after the disaster, much of the Exclusion Zone—now encompassing 1000 miles and also called the Zone of Alienation—is still strictly off-limits. The area remains a chilling reminder of nuclear disaster, while at the same time drawing thousands of tourists each year and demonstrating the resiliency of nature. Yes, there’s a hotel. It’s simple, best described as being in the “Soviet” style. According to the website Chernobyl-Tour.com, "visitors are provided with the iron-starched linen stamped by the Chernobyl special industrial complex." There is, however, Wi-Fi, enabling explorers the unique experience of being able to email friends and relatives from deep inside the Zone. The hotel is the only place for intrepid explorers to the Zone to stay, but its staff are only allowed to work on a strict rotation of 15 days in the Zone and 15 outside, to keep radiation levels to a minimum. Workers inside the Zone live in basic dormitories in the town of Chernobyl. 2. ... BUT YOU HAVE TO GET PERMISSION IN ADVANCE TO VISIT. Chernobyl is still impossible for tourists to get to without an official guide. There are strict military-style checkpoints at the 30km zone, at 10km, and at the entrance to the ghostly worker's town of Pripyat. Your name and passport have to be submitted to controlling authorities seven to 10 days in advance, and the guards check you and your passport numbers at each checkpoint. The early days of the Zone saw a large problem with local intruders who infiltrated the vast perimeter to ransack Pripyat and other areas, but since 2007 the Ukrainian government has severely clamped down on illegal intruders. 3. THE ZONE INCLUDES MORE THAN JUST CHERNOBYL. The gymnasium at Pripyat. Photo by Luke Spencer. Chernobyl was the largest town in what’s now the zone. Dating back to the 12th century, it was once a vibrant, largely Jewish town. The peaceful farming town, however, suffered at the start of the 20th century, when many of the inhabitants were murdered by first the Red Army and then during the Nazi occupation. At the time of the disaster, the population had increased, largely due to the nuclear industry, to approximately 14,000. Today, the ghost town of Pripyat attracts the most attention. Opened in 1970, Pripyat was designed as a model example of Communist city life. It was also surprisingly youthful: The average age of the roughly 50,000 inhabitants of Pripyat was about 26. The now-empty town had a discotheque, gymnasium, movie theatre, sports field, and the famous amusement park. One of the most-frequented parts of Pripyat, according to tour guides there, was the maternity ward, with the youthful population of Pripyat producing around 1000 babies each year. As roads have steadily deteriorated, the smaller towns deep in the Exclusion Zone have become cut off and remain mostly unvisited to even the seasoned tour guides. Across the border in Belarus, the effects of the explosion were similarly catastrophic, if not more so. An estimated 70 percent of the fallout descended on Belarus, contaminating approximately a quarter of the country. The most heavily hit areas in Belarus are now part of the 834-square mile Polesie State Radiation Ecological Reserve, a mixture of forests and deserted industrialized areas. Roughly 5000 people still work in the Exclusion Zone: mostly sentry guards, workers on the massive new sarcophagus, firemen protecting the still-volatile area from deadly forest fires, and service staff for the workers. Like the hotel staff, they live in the Zone on a rotation pattern of 15 days in, 15 days out, to keep their radiation levels manageable, staying in dilapidated concrete dormitories next to the hotel. 5. ... AND SOME PEOPLE LIVE THERE. About 180 older residents also live full-time in the zone, having returned to their ancestral villages despite warnings from the Ukranian government, which has now largely allowed them to return to their homes to die in peace. A recent documentary, The Babushka of Chernobyl, tells their story. 6. SO IT’S NOT EXACTLY DESERTED. Aside from the hotel, there is one bar, a post office that still makes one daily noon collection, and a supermarket, where produce is scarce but with the shelves are filled with alcohol. There is even a museum (never open) and something virtually non-existent in post-1991 Ukraine: a statue of Lenin. Because it remains frozen in time, Chernobyl is one of the few places where hammer and sickles can still be seen. 7. TOURISM IS BIG BUSINESS. Nikolai, a tour guide in the zone. Photo by Luke Spencer. The Exclusion Zone began allowing officially sanctioned visits, mostly for scientists and reporters, almost as soon as it was created. In recent years, tour groups have begun organizing brief, strictly controlled visits. One tour guide mental_floss interviewed, named Nikolai, says a couple has even gotten engaged on one of his tours. Beforehand, the proposer asked Nikolai if he could take them to the most contaminated area possible for the big moment. This year, the 30th anniversary, it’s thought that an estimated 10,000 visitors will step inside the Exclusion Zone. Inside Chernobyl, there is a strict curfew of 8 p.m. At night in the town square, one of the only things you can hear aside from the stray dogs barking is a strange sequence of rising electronic beeps coming from the forest somewhere to the north, which sounds a bit like the famous 5-note sequence in Close Encounters of the Third Kind. A tour guide said they come from the scientist's camp, which is constantly monitoring radiation levels. 9. EVERYONE GETS THEIR RADIATION MONITORED—EVEN THE TOUR GUIDES. Every visitor coming out of the Exclusion Zone goes through a radiation screening at each checkpoint. If your levels are too high, clothes and boots are either washed or left behind. Taking anything out of Chernobyl is forbidden. 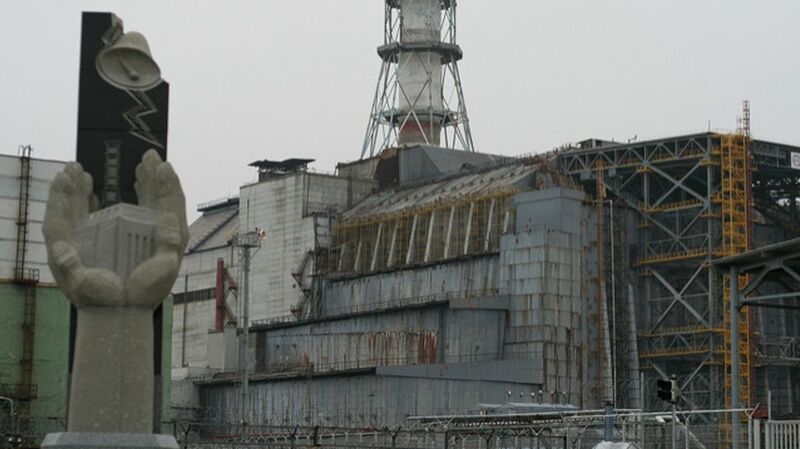 Tour guides like Nikolai are checked regularly, and say they don’t receive anywhere near the annual levels of radiation deemed too dangerous. 10. TOURISM THERE MAY NOT LAST. Despite the growing numbers of tourists, the Zone is still highly toxic and dangerous. The landscape is dotted with warning signs indicating where the “hot spots” are. Walking around is for the most part safe, but the greatest danger comes from ingesting radioactive particles. Nikolai has had to warn visitors against posing for photographs licking trees, eating berries, and rolling around in the earth. He particularly warns against following in the footsteps of “Bionerd23,” who posts videos of herself online fearlessly eating Chernobyl’s apples. Radiation levels in many places are safe, but parts of the Zone, particularly near reactor 4, and in basements of buildings such as Pripyat’s hospital, remain dangerously high. 11. THE REACTORS AREN’T THE CREEPIEST PART. The eerie Duga-3 radar base. Photo by Luke Spencer. One of the most remarkable parts of the Exclusion Zone is southeast of the reactors: the eerie Duga-3 radar station. Once one of the most secretive spots in the old Soviet Union, this vast construction of antennae and aerials was once pointed in the direction of the United States, listening in for incoming planes and missiles. On maps, it was marked down as a children's summer camp, while the locals were told it was a radio tower. Around 1500 high-grade technicians, scientists, and military personnel worked and lived here, wrapped in the highest levels of Cold War secrecy. There was even a kindergarten. Today, there is just one soldier guarding the peculiar complex, the propaganda murals on the walls decayed and long-forgotten. Inside the abandoned military compound of Duga -3. Photo by Luke Spencer. 12. THE FUTURE OF THE ZONE IS UNCLEAR. The zone will continue to be contaminated by the radiation from the disaster for about 300 years. Without many humans around, wildlife has returned to the area, which now teems with foxes, wolves, lynx, boar, moose, and rabbits, among other creatures. While some would like to turn the area into a nature preserve, its future remains a divisive topic in the Ukrainian government, with such plans under threat from Ukraine’s nuclear industry, which would prefer to use the toxic landscape as a fuel dump for radioactive waste. Today, Ukraine remains one of the countries most dependent on nuclear power for their electricity—which means all that waste has to go somewhere.